In preparations for the UFC I had started the habit of waking up at various times between 4:00 AM and 5:30 AM. I wanted to condition my brain to waking up early and not to a set time. So I felt pretty rested when the alarm went off at 4:00. 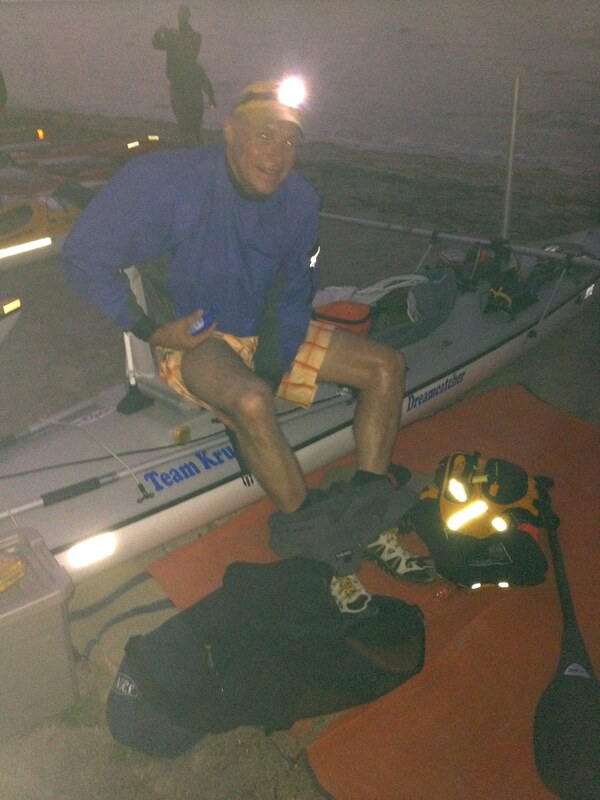 I put on my paddle clothes, grabbed an Ensure and an oatmeal breakfast bar, and let the dog out. That is when I saw the trees moving from the wind and started to realize I was going to be working HARD today. Not only was the wind blowing, but it was out of the south. Great!! Right in our faces. Hoping for the best I went in to listen the weather report. The only bright spot in the report was the fact that later in the day the winds were suppose to shift to the SW. Maybe, just maybe, if the winds did shift to the SW, I would have enough angle to be able to sail since I would be changing course to the SE to get across Sarasota Bay. Little did I know this was going to be my first of many mis-forecast from the weather guys. The drive over to Fort DeSoto was a quiet one. Most of the family was still sleepy so they piled into the car and zoned out. I have never been real talkative in the morning and I think Lisa was quiet because she was starting to worry. She never let on that she was worried but she was too quiet. The drive went by pretty fast and since it was still dark we joined the numerous headlamps and voices working their way to the boats on the beach. I really didn’t need to do that much to the boat other than to decide if I was going to deploy my akas and amas. If the winds did shift then this would make it easier for me to put the sail and mast up. If the winds didn’t shift I would have the additional surface area of the aka and ama for the wind to blow against. The sun was just starting to come up so I could see some of Tampa Bay and it didn’t look very friendly. There would be two other things I would gain by putting the akas and amas out. The first was that it would free up some space in the boat giving my legs more room to move around in. 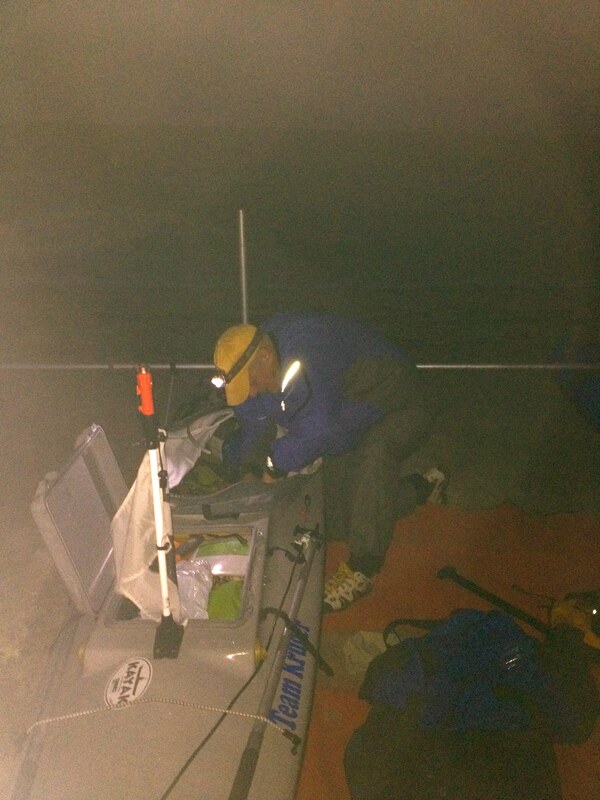 The second was that they would stabilize the boat allowing me to really get on top of my paddle stroke and it would also help me avoid expending energy trying to avoid getting capsized. 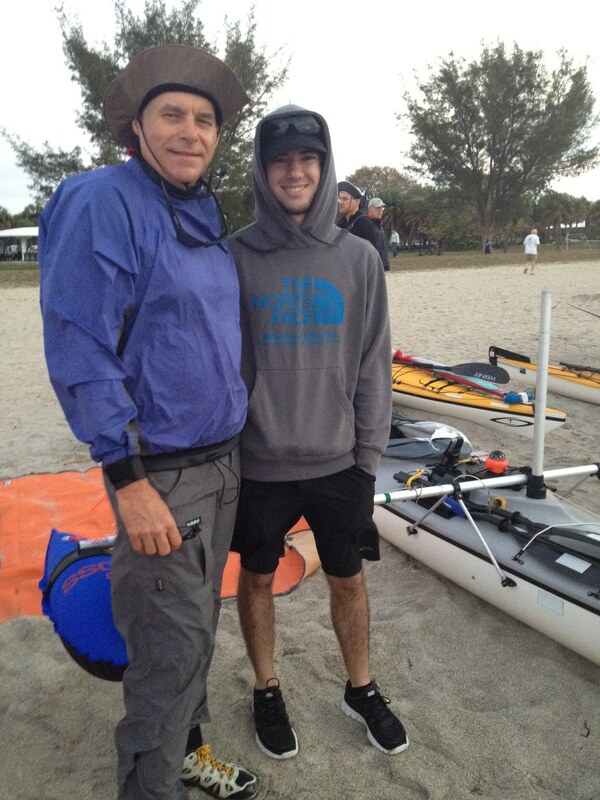 I did my first Everglades Challenge in a kayak and was surprised at how much energy I expended just trying to stay upright. Hoping for the best I decided to deploy the amas and akas. Now a few pictures were taken at the start and since I have a few comedians in my family I though it was prudent for me to clarify a certain picture. The comedians in my family will tell you that they have heard many times how I really think the Kruger Dreamcatcher is the best all around expedition boat and how I REALLY like mine. I can sleep in it, I can sail it, I can paddle it with a canoe paddle or a kayak paddle, I can take it out in big water, I can take it on a river,and I can run it into and over rocks and it will never let me down. Now, based on this picture, the comedians in my family state, “Use #87 for the Kruger — an emergency toilet!” Funny, teenagers, lucky for them I love them but that is NOT what was going on here. I was putting on sun block, nothing else. How about the fashion statement from those board shots? My daughter bought them for me so I wore them until I had lost so much weight that they were falling off of me. Not a pretty sight. Every start I have been in the 15 minutes before the start things seem to get really hectic. Last minute checks, roll call, last-minute photos that are all smiles, and THEN Chief has to get some folks to back there boats back to the high water mark. I find this pretty humorous. We are looking at a multi day race and folks are trying to get a few extra feet jump at the start. 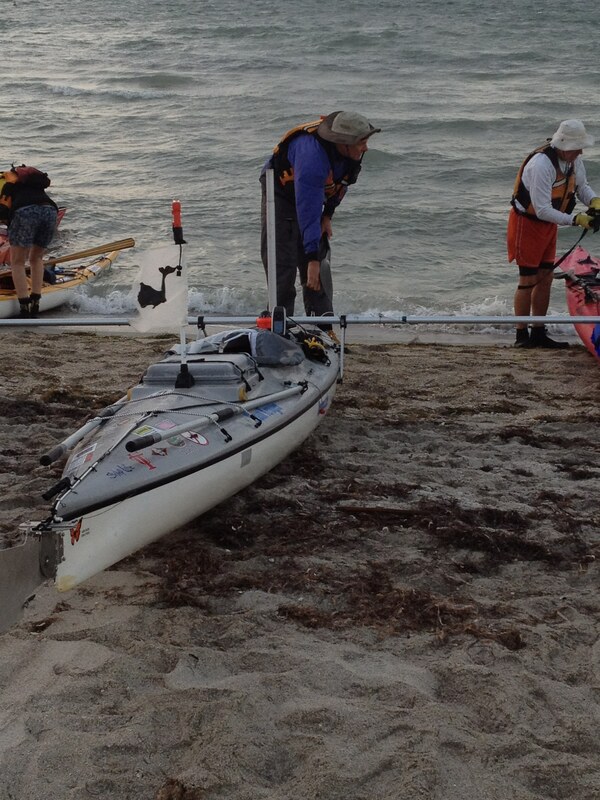 There are folks that actually run to the water’s edge all the while dragging their boats when the start horn goes off. The really funny part of this is that there is a sand bar about 20 feet from the beach that you have to get your boat over. So you watch these folks run to the water, rush to get into their boats and get their spray skirts on and then start paddling furiously only to run into the sand bar. Usually they have to get out of their boats or they stay in their boats and try to work their boats over the bar with their hands. Really!! Spending a few minutes to launch in a relaxed controlled way is not going to make the difference of whether someone is going to be a class winner. I usually just walk my boat through the water and over the sand bar. This year was even more chaotic than previous years due to the winds. I wasn’t more than 50 feet from the beach when a kayaker paddled right in front of me only to flip. He said he was ok and didn’t need any help but I felt for him. If he was struggling here where the waves were smaller then he was in for a terrible experience in the middle of the bay. The other thing that was different this year is Chief was walking up and down the beach telling folks it was ok not to launch and wait until conditions got better. My thought process was that would be problematic. The weather forecast indicated that things were going to get worse before they would get better. I decided to launch and accept that I was going to be working hard. I just didn’t know how hard I was going to work. These are some videos of the start.